The month of July is dedicated to the Most Precious Blood of the Redeemer. Supreme homage is given to the Sacred Blood. As we adore the Sacred Heart, because it is the Heart of Jesus, who is God, so we adore the Most Precious Blood. The Blood of Jesus is the fountain of salvation. Each drop that flowed from the wounds of the Saviour is a pledge of man's eternal salvation. All races of the earth have been ransomed, and all individuals, who will allow the saving power of the Sacred Blood to be applied to their soul, are heirs of heaven. 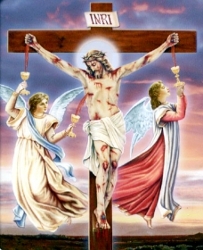 St. John Chrysostom calls the Precious Blood the saviour of souls; St. Thomas Aquinas, the key to heaven's treasures; St. Ambrose, pure gold of ineffable worth; St. Mary Magdalene de Pazzi, a magnet of souls and pledge of eternal life. The sins of mankind, in their number, in their offense to the Supreme Being, in the effects on transgressors, are immense; yet, the Precious Blood of Jesus is not frightened by numbers, it has in Itself the power to appease an angered God and to heal wounded creatures. The Precious Blood is a cleansing bath. Unlike all other blood, which stains, the Blood of Jesus washes clean and white. According to the words of St. John, in the Apocalypse, the Angels wonder, and the question is asked: These that are clothed in white robes, who are they? The Lord answers: These are they that have washed their robes, and have made them white in the Blood of the Lamb. For no other reason did the Precious Blood flow but to regain for the souls of men the beautiful dress of innocence, and , once regained, to preserve it throughout life and into eternity. The Blood of the Saviour is a well of consolation for troubled hearts. Can anyone, confidingly, look at the Sacred Blood trickling down from the Cross without taking courage to carry on, in spite of the difficulties which are the common lot of all? One glance at the Cross must be able to drive away fear. And, another, must be able to instill trust in Him who did not rest until the last drop, mingled with water, flowed out of an opened Heart. He, who was willing to do so much for men, must be willing to overlook and forget the frailties which they deeply regret; He must be willing to come to their assistance when harassed, to defend them when tempted, to comfort them when afflicted. The Blood of Jesus must be for Christians what the north-star is to sailors. Would that men on earth honored the Precious Blood in the manner in which they who are in heaven give honor and praise and thanksgiving! They proclaim that It purchased the glory which they enjoy. Without It, they would have remained slaves of Satan and outcasts from the eternal mansions of God. Let us profess that we owe to the Sacred Blood of Jesus all that we have in this life, and that to It we shall owe all that we shall enjoy in a better and eternal life! And I, if I am lifted up from the earth, will draw all things to Myself.